I knew a fellow years ago who sold products for use in computer tape libraries. I know that’s in the dark ages for many readers, but the example I want to cite is too good to pass up. Imagine for a moment what a tape library might look like for a major corporation. Think row after row of multi-tier tape racks holding thousands of reels of computer tape—that’s magnetic computer tape—each reel holding data files or application programs used to run the enterprise. If you lose one of those tapes, payroll doesn’t run, or the customers aren’t invoiced for that month. You get the idea; it’s important. Keeping track of all that media as it was called out for jobs and returned to storage following jobs was a big responsibility. My pal had been asked to see if he could find a good solution for labeling and marking the various aisles, tiers and individual shelves on which the tapes were stored in a large tape library. This was meant to speed the retrieval and replacement of tapes by the tape librarians. My pal had looked far and wide for the perfect solution, and when he found it, he quickly made an appointment to visit his prospect. He proudly placed a wide variety of samples before his contact who stared down at the brightly colored signs. “How do they attach to the shelves?” asked his contact. “Why, they are fully lined with a strong magnetic material that holds them fast to the shelf!” my pal proudly replied. My friend was quickly and unceremoniously removed from the premises amid some strong language related to magnetic tapes, magnetism sources and corrupted data. This is the kind of story that makes product managers and engineers seethe. The product management process designs products that solve specific problems. But, without a product configurator, or similar product management tool, reps and customers will try to use products for purposes they were never intended to address. This can have effects that are anything from inconvenient to disastrous. Product configuration is powered by data. That data must come from Product Management (or Engineering) in the form of limitations on how parts and assemblies are matched up to address a prospect’s needs. CPQ can easily do this via an interview questionnaire. How is the product going to be used? What is the environment? What is the anticipated maximum load or frequency of use? Questions like these establish the assorted usage limits for the individual part selected, assembly design and overall configuration. Companies that do not pay heed to this information can quickly find themselves in trouble. If you sell rope and offer up a clothes line as a high-performance rock-climbing rope, you are going to find your company in great legal jeopardy. A product configurator turns this around. You have clothes line for sale. What is the load limit for clothes line? What is the effective performance life when exposed to elements? Your product management team builds questions into the configuration script. They will start by asking, what is the maximum load you need to lift with our ropes? Once that is established, they will move on to the environment. How much time will the ropes be exposed to the elements per year? Both of these questions will eliminate clothes line from the list of options for rock-climbing. The great advantage of a product configurator is that the wisdom and knowledge of the expert is available to your rep in the field at any time. The phone call to corporate, the “I’ll get back to you” and similar delays are eliminated but at the same time, the rep isn’t placed into the position of having to guess or assume something beyond their knowledge. 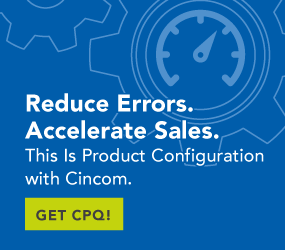 The company reduces its liability, and the customer is assured of a product that will perform up to their requirements—an effective product management process powered by a top-quality product management tool: a product configurator.